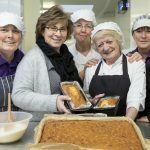 Pendine Park care home says goodbye to “very own Mary Berry” | News by Wales Express News, People Before Profit! Pendine cook-1, 2 and 3 cook Carol Roberts who is retiring from Pendine Park after 32 years of service in the kitchens. Pictured is Cook Carol Roberts. Pendine-6 cook Carol Roberts who is retiring from Pendine Park after 32 years of service in the kitchens. 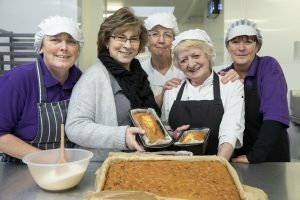 Pictured ( L/R) Diane Bellis, Karen Hesketh, Carol Roberts and Karen Day. Pendine cook-7 and 8 Pictured Cindy Clutton Manager at Gwern Alyn and cook Carol Roberts. Pendine cook-9 cook Carol Roberts who is retiring from Pendine Park after 32 years of service in the kitchens. Pictured ( L/R) Diane Bellis, Cindy Clutten Manager at Gwern Alyn) Karen Hesketh, Carol Roberts and Karen Day.